In recent years, LED lighting has gone from the fringe to mainstream in terms of marine applications. Today LEDs are replacing halogen and other incandescent bulbs both on deck and below, in uses ranging from masthead running lights to reading lights in the saloon. Despite their higher costs—about three times that of their halogen counterparts— LEDs have gained ground thanks to their longevity and low power draw. The lifespan of an LED is measured in tens of thousands of hours. The widely accepted L70 standard, for example, requires that an LED bulb still generate 70 percent of its original output after 50,000 hours. That’s 5,000 nights afloat, assuming 10 hours per night. LEDs require a fraction of the amps needed to illuminate a halogen bulb—in general about two-thirds to three-quarters less. LEDs are also much cooler. This can make all the difference in the world if you bump against a reading light when snuggling up with a book in the saloon. Early-generation LEDs created a bluish light that many found unappealing. For general area lighting, “a color temperature” of around 2,700 degrees Kelvin to 3,000 degrees is desirable. Even with the correct color temperature, the quality of light given off by some LEDs, as defined by a color rendering index, or CRI, is not as good as that from halogens and other lamps. Nonetheless, engineers have made great strides and LEDs are now more than suitable for spending a comfortable night in the saloon. To see if reality matched the hype, I went down to the IMTRA plant in New Bedford, Massachusetts, to put some of the company’s interior LED lighting through its paces. For my tests I commandeered a pair of boat-show halogen and LED displays that IMTRA had sitting around, using them as a kind of test bench. The two displays included an assortment of lights duplicating the basic lighting plan of a 35-foot boat. In actuality, they constituted a very basic lighting plan, compared to the lighting arrangements found on many boats these days. Nonetheless, the arrangement worked well for our purposes, thanks to a set of integral digital amp meters, which showed how much each bank of lights was drawing at any given moment. Except for the fact that one was halogen and the other LED, the two separate displays were identical. They included a pair of Avalon 155 overhead lights; a pair of Avalon 105 overhead lights; six smaller Ventura (LED) or Newport (halogen) overhead lights over the settees; a small Portland overhead light in each cabin; two reading lamps, one in the forepeak and one in the quarter berth; and two small “courtesy” lights set in the steps of the companionway and in the galley. To obtain a complete picture of how the two lighting technologies performed, we took measurements using a variety of different lighting combinations. 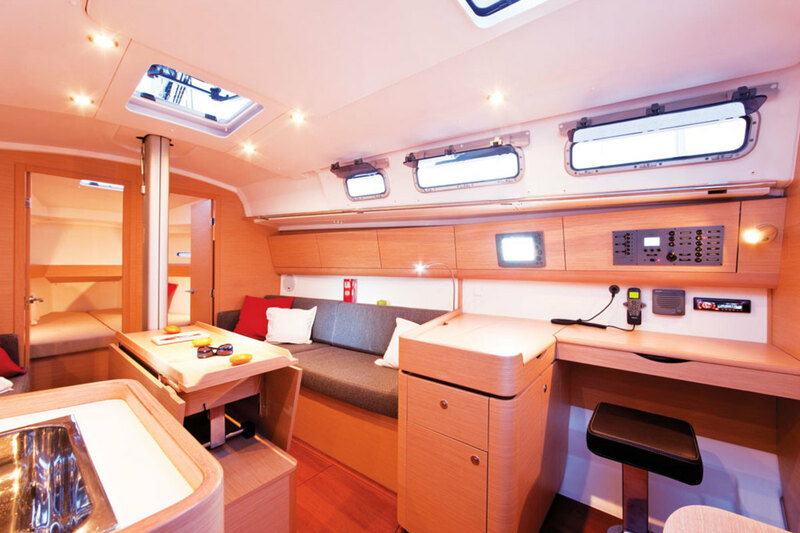 The idea was to mimic the way lights are typically used on passage or during a coastal cruise. We also used two different power sources: a 12.4-volt battery bank and a regulated power supply plugged into the plant’s overall AC system. We did this for two reasons. First, using the battery, we more closely mimicked the situation aboard a boat. Second, by comparing the two we could illustrate one of the basic differences in the way halogen bulbs and LEDs operate. Specifically, with a halogen bulb, the amount of light generated varies with the power supply. Each bulb consists of a wire filament that glows as electricity flows through it. More electricity means more light—less electricity means less light. That’s why a halogen flashlight grows dim as the batteries discharge. Higher quality LED fixtures, on the other hand, like those in our test, include circuitry that causes them to glow with the same intensity no matter how much voltage they receive. They will continue to shine as brightly, generating the same wattage and drawing whatever power they need, no matter how weak the power supply. The result is that an LED will draw slightly more current as voltage drops to make up for the lack of energy in the system. The relationship is defined by the equation below. Note how the amps need to increase as volts fall if the watts are to remain constant. The regulated power supply we used provided a steady 13.8 volts, the equivalent of a fully charged house bank aboard a boat. At 12.4 volts, our battery bank was roughly equivalent to a slightly discharged sailboat house bank. Tables 1 and 2 clearly show that LEDs draw dramatically less current than their counterparts, no matter the situation. The data also highlight the difference between the two technologies, with the LEDs drawing more amps when hooked up to the battery. We didn’t have a means of measuring light intensity (the displays were too big to fit into a dark room so we couldn’t isolate them from the ambient light), and at such high voltages, the halogen lights looked the same no matter what the power supply. However, it’s safe to say they were producing less light. When running off the battery, the LEDs required a little under 30 percent of the current required by their halogen counterparts. When hooked up to our constant power supply, they drew about a quarter of the current. In either case, we’re talking about a substantial increase in efficiency and savings. 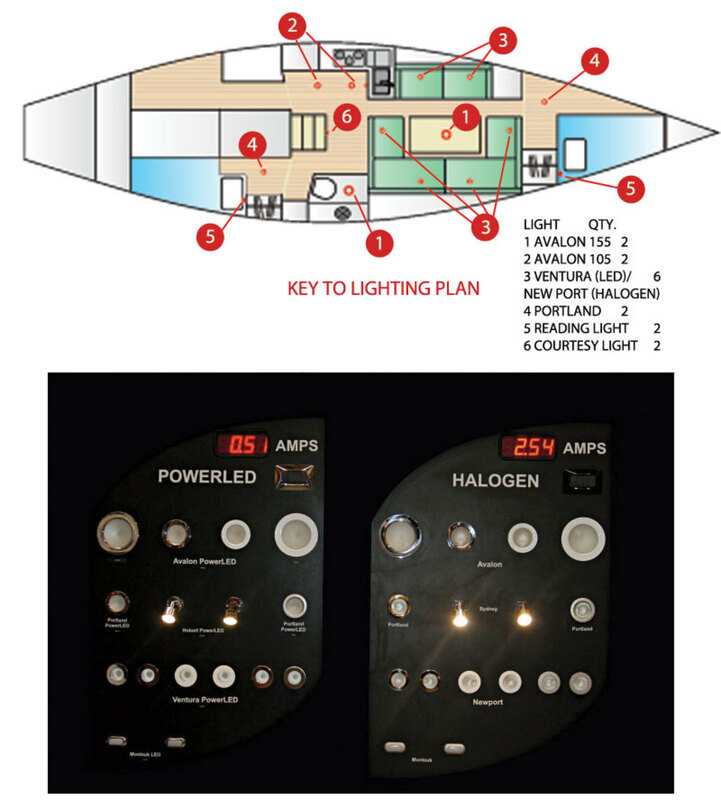 Running the entire halogen lighting plan for just two hours, for example, would discharge 37.26 AH (2 hours X 18.63 amps) from the boat’s house bank. Those same two hours would discharge just 11.90 AH when using LEDs. With the 25.36AH you save, you could run a refrigerator for half a day. And remember, this is for a conservative lighting plan. It also doesn’t include any other light usage after the sun goes down. Let’s say some of the crew stays up late on a rainy night swapping yarns in the saloon. Two additional hours of one-upping each other over rum drinks will add another 30.98AH to the daily load with a set of halogen bulbs in the saloon, while LEDs will consume just 9.58AH. Now the total lighting difference for the evening is 46.76AH—and we still haven’t included things like courtesy lights, cabin lights or reading lights after the crew’s less garrulous members retire to their quarters. In terms of dollars and cents, it’s next to impossible to quantify the differences given all the variables involved. These include everything from battery cost to fuel cost, alternator efficiency, the cost differential of the lights themselves and the difference in ownership costs of the lights given the longevity of LEDs. Nonetheless, the switch to LEDs might easily allow you to get by with a slightly smaller house bank. You might also be able to add an additional piece of equipment without upping your total power usage or putting more strain on your house bank, thereby prolonging its life. Never forget that a battery’s rated amp-hour capacity is far greater than the number of amp hours it can actually provide. 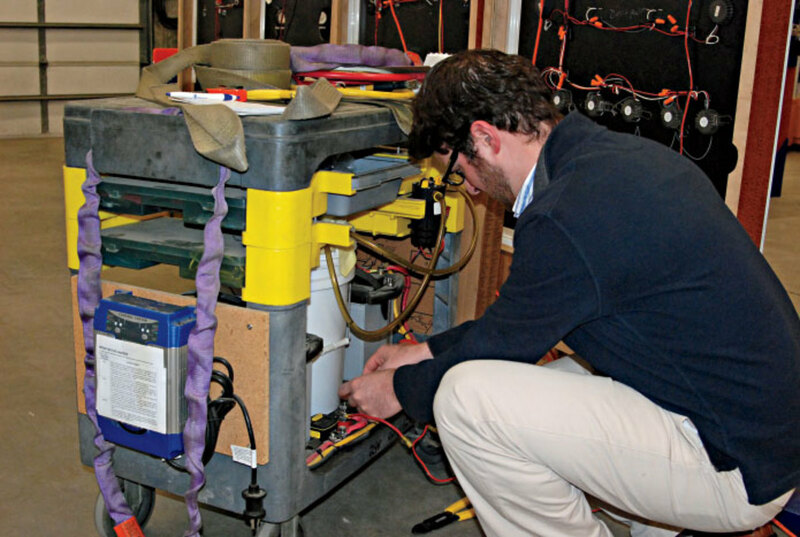 Because of the inefficiencies inherent in traditional battery technology (modern lithium-ion batteries behave considerably differently), a 50AH difference in energy usage is roughly equivalent to 100AH or more in battery capacity. Equally important, if not more so, is the impact this savings will have on generator or alternator running time. Again, lots of variables are involved, but aboard a typical 35-footer, like the one in this test, the difference could be an hour of engine running time per day on passage or at anchor. Now the decision to switch to LEDs becomes a quality-of-life issue. No matter what the cost of fuel, nobody likes running their auxiliary for the purpose of topping off the batteries. In terms of peace and quiet alone, this simple study shows LEDs are worth the trouble and expense. The first practical LEDs, which were introduced in the early 1960s, were only capable of emitting a low-intensity red light, but researchers have dramatically expanded the intensity and color range since then. A typical LED is housed in a small plastic-filled lens. A tiny semiconductor chip—the actual diode creating the light—is mounted on one electrical lead and connected to the other by a thin wire, or connected to two thin wires. 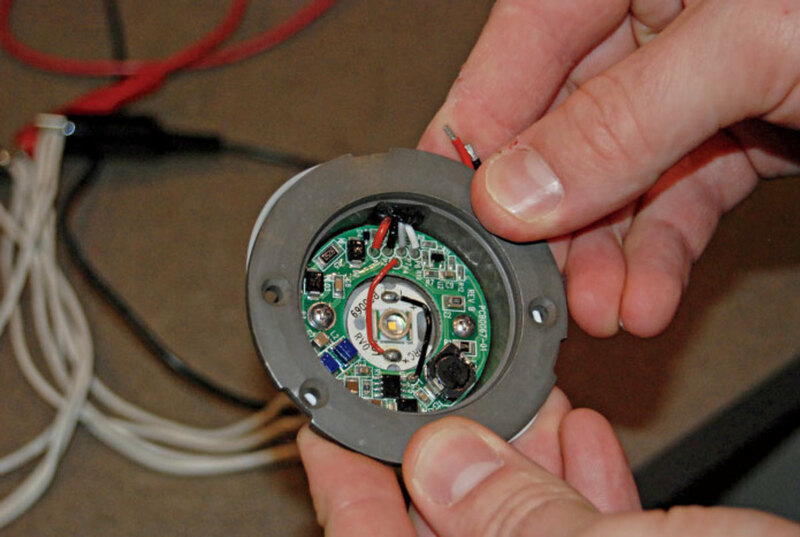 Critical to the function of any LED in a lighting fixture is its “driver,” the circuitry that ensures the LED receives a constant DC current. Even small variations in current can result in dramatic color changes and reduced lifespan. Drivers also make it possible to add a dimmer function to an LED and protect the LED from current spikes that would otherwise damage the system. In essence, the driver serves as an individual power-supply unit for each LED.